Lindsey Graham just announced that the GOP's gun confiscation bill is dead. Instead, he will work with Sen. Richard Blumenthal to come up with a nationwide gun confiscation bill that both parties support. Already, Democrats are demanding more gun control before agreeing to support Graham's plan. The GOP held their hearing on this when the news first broke that the Mueller investigation was over. While the entire media was focused on Russian collusion (or lack there of), the Republicans were holding hearings on gun confiscation policy. With the full report set to be released this week, that is when the establishment will strike again! Please, stop the GOP from passing this horrible gun confiscation bill! Send your instant and urgent FaxBlast to Congress (below) and force them to KILL Lindsey Graham's "compromise" Red Flag bill before it's too late! There is no "compromise" to be had on the 2nd Amendment. The right to keep and bear arms exists precisely to protect the American people from the government. And yet, your colleagues are working on a bill that would impose a nationwide gun confiscation program and allow police to confiscate guns without even having to accuse gun owners of breaking the law! Right now, Federal law allows for 7 ways to confiscate someone's firearms. Someone needs to be (1) convicted of a felony or violent misdemeanor, (2) adjudicated mentally defective, (3) dishonorably discharged from the military, (4) an illegal alien, (5) a fugitive from justice, (6) a domestic abuser, or (7) a former-US citizen, meaning they gave up their citizenship. And the burden of proof rests entirely on the prosecutors. 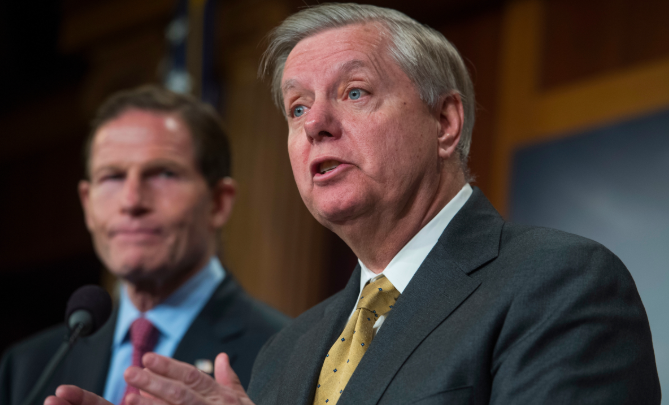 The "Red Flag" law that Lindsey Graham and Richard Blumenthal are working on would lower the evidentiary bar to include "hearsay" in that list. If a family member, neighbor, or friend tells police they think someone is dangerous, that would suddenly be enough for a confiscation order. It would then be up to the disarmed gun owner to convince a judge they deserve their guns back. If the judge disagrees, then the confiscation order can be extended for a year. This plan makes every gun owner in America guilty until proven innocent. It is a disgrace. And yet, your colleagues are racing to try to push it through. Their plan is to use the Mueller report's release as political cover to push through the biggest gun confiscation bill ever. They are counting on people like me not paying attention. I am writing to tell you that I am paying attention and if you allow this Graham-Blumenthal gun confiscation plan to move forward, you are finished. That's not even a threat... it's a promise. The 2nd Amendment exists to protect us from bills like this. If you give police the power to suspend the 2nd Amendment without even needing to prove someone did something wrong, then the right to keep and bear arms will become nothing but a privilege. If you allow that to happen, then you are an enemy of the people and I will not rest until you are removed from office.